The succeeding paragraphs give a brief introduction about the Indian Grid System. It may be too technical for some. However, it skips a lot of details to make it balanced for novice readers. The Indian Grid reference system is a system of geographic grid references different from the Geodetic Coordinate System (Longitude/Latitude). This system is used specifically by Survey of India Maps and consequently by a large number of Indian Government organisations. The Indian Grid was designed during British days (pre-Independent India) and is consequently similar to the British National Grid System. It covers the Indian subcontinent: India, Afghanistan, Bangladesh, Bhutan, Cambodia, Laos, Myanmar (Burma), Nepal, Pakistan and Vietnam. It also covers certain parts of China (Tibet), Iran and Thailand. Referring to locations by grid coordinates is much easier. Distance and bearing calculation between two grid coordinates is much simpler with adequate accuracy. The Indian Grid uses the Indian Geodetic Datum (sometime written as Indian Datum, parameters here), which uses the Everest Spheroid as reference surface (i.e. it defines the shape of the Earth). It was originally defined in 1830 by Colonel George Everest (Surveyor General of India from 1830 to 1843) based on Great Trigonometrical Survey initiated in 1802. This was subsequently updated in 1888 and then in 1956. Kalyanpur (Madhya Pradesh, 77.65489°E	24.11981°N) in central India was chosen as initial point of origin. The Earth's spherical (or rather ellipsoid/spheroid!) surface needs to be depicted as a flat surface for maps. There are a number of ways to do this, known as map projection systems. All of them have their own advantages and disadvantages. The Indian Grid uses the Lambert Conformal Conic Projection system (also known as Conic Orthomorphic Projection) with 2 Standard Parallels. Zone 0 - India and Pakistan North of 35°35'N. Zone IA - India and Pakistan 28°N-35°35'N. Zone IB - Unknown parts of China (Tibet). Zone IIA - India 21°N-28°N & West of 82°E and Pakistan South of 28°N. Zone IIB - Complete Bangladesh, India North of 21°N & East of 82°E and Myanmar (Burma) North of 21°N. 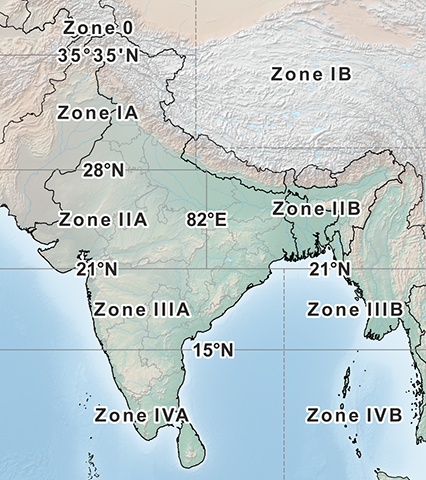 Zone IIIA - India 15°N-21°N. Zone IIIB - Myanmar (Burma) 15°N-21°N. Zone IVA - India South of 15°N. Zone IVB - Myanmar (Burma) South of 15°N. Note: The area of use given for the Zones are from freely available sources and not the official specifications. Any location in the Indian Grid is donated numerically by a grid reference, given as a pair of Easting and Northing (x, y; with Easting increasing from West to East and similarly Northing increasing from South to North). Originally these were in Indian yards (0.9143988m), but was changed to meters subsequently. Easting and Northing each is a seven digit number giving a resolution of 01 meter. Thus the complete grid reference with the Easting first and the Northing next. For e.g. Easting: 1234567; Northing: 3456789 will be denoted as 1234567 3456789. Also, do keep in mind, only knowing the Easting and Northing is not adequate. One also needs to know the Zone (there are a total of nine of them as brought out earlier) to which the grid reference belongs, as without knowing the correct Zone, there are total of nine totally different possible locations! So it is equally important to be aware of the Zone. The first common practise is to do away with the first two digits and use the last five digits each. This is especially used with Grid Letters. This is as the first two digits correspond to 105 meters i.e. 100,000 meters (100 Kilometres). So this can be resorted to if we are concerned with a specific area smaller than 100 Kilometres. But for large distances this will lead to confusion. The same is explained in the figure below. 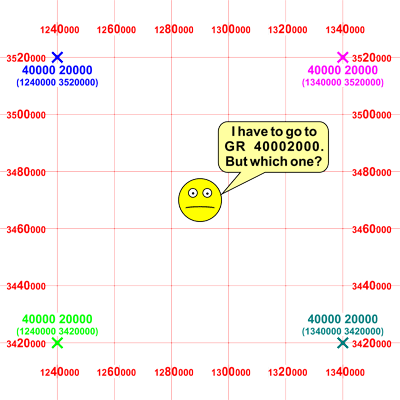 All the four marked positions (1340000 3520000, 1340000 3420000, 1240000 3420000 and 1240000 3520000) have the same grid reference (40000 20000) with the first two digits omitted! So, it is preferable to use the complete grid reference. Omitting the first two digits (or even a single for that matter) of the Easting and Northing will not pinpoint the exact location, as there will be a number of possible combinations within the Zone. The second common practise is to do away with equal number of last digits of the Easting and Northing. This leads to lesser resolution in the location. For e.g. if the grid reference is 1234567 3456789. It can be expressed as 12345 34567 (12345673456789) i.e. with a resolution of only 100 meters. So the grid reference 12345 34567 would be taken as 1234500 3456700. Note this is off the actual grid reference by almost 111 meters! Thus, the resolution will decrease in case this practise is adopted. However, this is less of concern as the resolution of maps and methods of determining position have limited accuracy. Even with standard commercial GPS receivers errors of up to 10m are common. These omissions can be made in combination. For e.g. the grid reference 1234567 3456789 can be expressed as 345 567 (1234567 3456789). These again suffer from the limitation as discussed for omission of the first two digits of Easting and Northing and also reduced resolution. 4 figures - resolution of 1Km/1,000m : 34 56 (1234567 3456789). 6 figures - resolution of 100m : 345 567 (1234567 3456789). 8 figures - resolution of 10m : 3456 5678 (1234567 3456789). 10 figures - resolution of 1m : 3456 5678 (1234567 3456789). 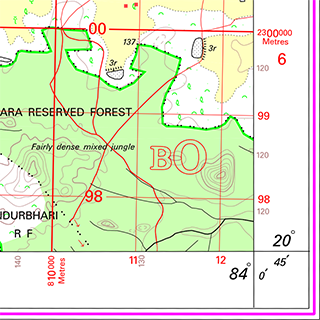 To reduce the number of figures needed to express a Indian Grid reference, a system of Grid Letters is also used. Each Zone is divided into primary squares of 500,000 units (metres). Each of these 500,000 primary square is further divided into twenty five secondary squares of 100,000 units. For both of these the squares are lettered increasing from west to east and then from top to down. The letter I is omitted. Thus two letters can denote a specific 100,000 unit square. The second letter of the Grid Letters is printed bigger than the letter of the primary grid square on maps. All the four corners have the relevant Grid Letters marked. Also, every tenth line is made thick and the full grid value is written on the map margin. So for the grid reference 12345673456789, the Easting is 1234567 and Northing is 3456789. For the Primary Grid, 1,000,000 and 3,000,000 falls in 'S'. In Secondary Grid 200,000 and 400,000 falls in 'C'. Thus 12345673456789 will be written as SC 3456756789 (12345673456789). It can also further be reduced to SC 345567 (12345673456789) as explained above. Grid Letters can and do repeat over a large area (i.e. approximately 2,500Km)! Thus, they can not by them self specify a unique location. For example 19360000634000 (82.10397°E 23.24649°N) and 44360000634000 (106.48254°E 22.50198°N) are both valid grid references in Zone IIB. They can both be written as TU 3600034000 and are 2,496 Kms away from each other! In practise however, within a limited area this is not an issue. Semi-Major axis/Equatorial Radius - 6,377,301.243m. Inverse flattening (1/f) - 300.8017. Semi-Minor axis/Polar Radius - 6,356,100.228m (calculated from 1/f). Conversion - Convert between geodetic coordinates (longitude/latitude) and Indian Grid coordinates. Deesha - Award winning, completely free and offline app with full support for Indian Grid system. Settings for Garmin - Configuring Garmin navigation devices for using Indian Grid system. Defense Mapping Agency Technical Manual - Datums, Ellipsoids, Grids And Grid Reference Systems (PDF - 17.6 MegaBytes). 'An Introduction to Geoinformatics' by G S Srivastava (ISBN: 9781259058462). Ellipsoids & Datums (PDF - 496 KiloBytes). User's Handbook On Datum Transformations Involving WGS84 (International Hydrographic Organization) (PDF - 451 KiloBytes).